Account Based Marketing Blogs List. The Best Account Based Marketing Blogs from thousands of Account Based Marketing blogs on the web using search and social metrics. Subscribe to these websites because they are actively working to educate, inspire, and empower their readers with frequent updates and high-quality information. Account Based Marketing newsletter is a comprehensive summary of the day's most important blog posts and news articles from the best Account Based Marketing websites on the web, and delivered to your email inbox each morning. To subscribe, simply provide us with your email address. Facebook fans 344. Twitter followers 1,691. New Jersey About Blog The go-to source for cutting through the hype and getting real world perspective from actual practitioners on Account-Based Marketing. Facebook fans 152. Twitter followers 251. San Mateo, CA About Blog Thoughts and best practices about Account Based Marketing and Account Based Everything from Engagio and our fishing buddies. Facebook fans 511. Twitter followers 5,767. Atlanta, GA About Blog Terminus is the leading B2B Account-Based Marketing Platform that enables marketing and sales teams to run ABM at scale. Follow this blog to know the latest from the ABM experts. Facebook fans 711. Twitter followers 6,532. Washington, DC About Blog Triblio is a comprehensive account based marketing software solution that includes web personalization, account based advertising, sales reports and more. This article provides resources and articles on Account Based Marketing. Facebook fans n/a. Twitter followers 1,461. San Mateo, CA About Blog Account-based marketing (ABM) is a strategic approach that organizations are implementing to target and engage their audience and drive revenue across the business. Where broad-based demand generation strategies focus on generating a large pool of leads and qualifying a few, an ABM strategy focuses your resources on a targeted set of accounts. Follow this blog to get tips and tricks on Account-Based Marketing. Facebook fans 178,493. Twitter followers 159,359. About Blog Marketing Land provides Account-Based Marketing news and analysis, along with columns covering practical tips and strategies to succeed with online marketing. Facebook fans 189,145. Twitter followers 195,288. About Blog Forrester is an American market research company that provides advice on existing and potential impact of technology, to its clients and the public. Follow this blog to find articles on Account-Based Marketing. Facebook fans 27,958. Twitter followers n/a. About Blog ABM is the practice of identifying key accounts and/or high value prospects with coordinated marketing programs. Learn how to leverage account-based marketing. Facebook fans 1,839. Twitter followers n/a. Hicksville, NY About Blog ListenLoop combines retargeting and account-based marketing in a B2B Advertising platform. Follow this blog to know how to measure ABM success, ABM campaigns, ABM strategies and much more. Facebook fans n/a. Twitter followers 393. Montreal About Blog Learn the latest trends and strategies in Account Based Marketing from the Perkuto Blog, and accelerate your ABM efforts today! Facebook fans 174. Twitter followers 474. London, San Francisco, Sofia About Blog Agent3 are experts in data, technology and content marketing. Their end-to-end Account-Based Marketing programs are driven by insights and results in sales pipelines that are quicker to close. Follow this blog where Agent3 shares tips for personalizing ABM content. About Blog The ABM Leadership Alliance unites industry-leading technology partners to educate B2B marketers about how developing and deploying an ABM strategy can help them close bigger deals with target accounts and increase pipeline velocity. Follow this blog where ABM Leadership Alliance provides news on account based marketing insights and innovation. England, United Kingdom About Blog Get the latest insights from our team of inbound account based marketing experts. Get advice, ideas and inspiration from the Inflowing blog. Facebook fans 23. Twitter followers 50. About Blog B2B account based marketing and advertising platform delivering tailored advertising to your target customers by focusing your advertising message just to the companies you want to reach. Facebook fans 21. Twitter followers 54. About Blog The ABM Consortium advocates and consults with B2B marketers to help them better understand and deploy “High-Performance Account-Based Marketing” programs. This blog features the recent actions of ABM Consortium. 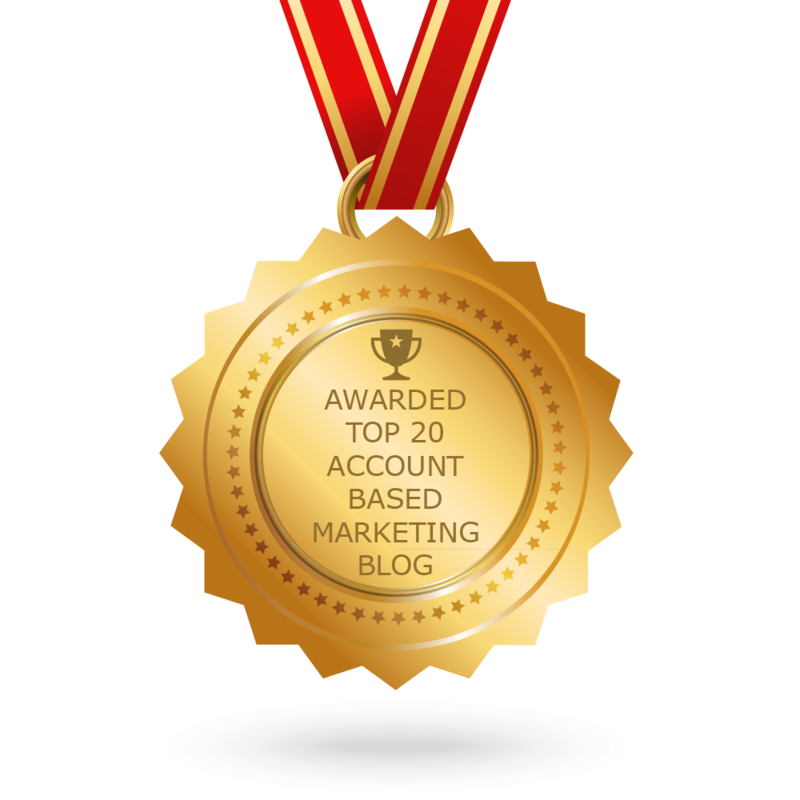 CONGRATULATIONS to every blogger that has made this Top Account Based Marketing Blogs list! This is the most comprehensive list of best Account Based Marketing blogs on the internet and I’m honoured to have you as part of this! I personally give you a high-five and want to thank you for your contribution to this world.